might be able to do free click and collect of they have stock near you. If you are handy with a needle and thread, you could buy three pandas, …If you are handy with a needle and thread, you could buy three pandas, join them together and create a real Christmas surprise for the kids. Bear with me, I promise I won't panda to anymore of this nonsense! If you are handy with a needle and thread, you could buy three pandas, join them together and create a real Christmas surprise for the kids. All gone. Would have been perfect for my niece as well. Daughter would have loved the elephant one, shame. I made it on to the WhatsApp message! Woohoo that's a first for me! 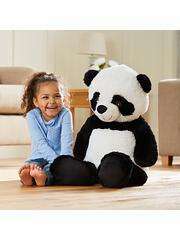 Good call, my niece is getting a panda centipede. For those of you that missed this deal, they keep updating stock regularly. I missed it this morning, but kept checking throughout the day... I've just bagged a giant panda and 2 giant unicorns. God help me.